This guide will tell you what the Bonus Money Dutching calculator is capable of. It will take you through everything you need to know to get set up for using the dutching calculator. It will teach you what each area of the dutching calculator means and how to personalise your calculator to fit your needs. If you master the art of using the dutching calculator you will become a more profitable matched bettor. What does the dutching calculator do? The dutching calculator from Bonus Money pulls in current odds from bookmakers and Betfair and displays which outcome to bet on so that you can effectively place many bets on the same game. Enabling you to qualify for many potential bonuses. Before you begin using the calculators visit your settings page and select which bookmakers you currently have accounts and that you are able to receive promotions from. This setting affects what you see in both the offer calendar and the dutching calculators. You can select these manually on each individual calculator but this method is much quicker. The image above shows someone who has deselected Palmerbet and Pointsbet in the settings. To select or deselect simply click on the logo. Click Save once you are done. Like the offer calendar, the dutching calculators are only available to Bonus Money Pro members. To access any of the dutching calculators first click through to the offer calendar and then click on any of the individual events. There are currently dutching calculators for all AFL, NRL, EPL, Big Bash, NBA and NFL games that have at least one match odds offer. Underneath the offers, you can see the dutching calculator itself. Within the dutching calculator, there is the following. To switch between basic and advanced mode. The ability to turn inline scrolling on and off. To switch between showing only active bookies (ones that have promotions and that are selected in your bookie settings) and showing all bookies in the calculator. The list of bookies, suggested stakes for the promos, the suggested stake to place at the bookie and the odds for each selections. Betfair, the commission rate for the event, the suggested stake to place as a back bet at Betfair and the odds for each selections. The Profit/Loss for each selection and that referred to as a percentage of the total amount placed in bets. A button to recalculate optimal stake. 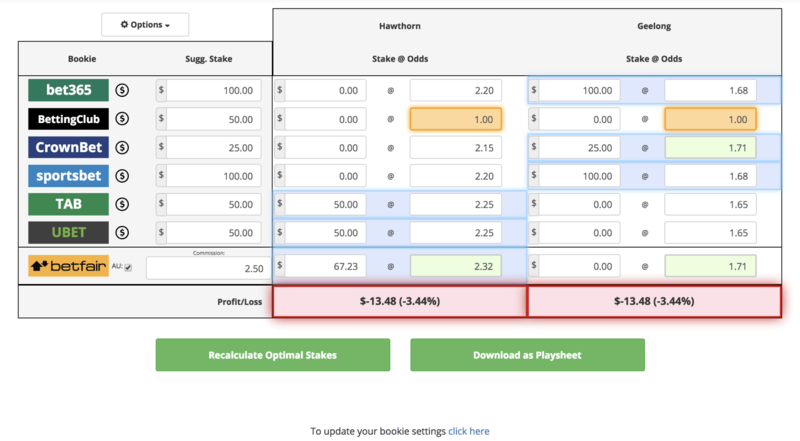 A button to download the bets from the calculator in to a spreadsheet. If you rollover the $ next to the bookies logo you can find out the EV and the trigger for the promotion as well as any extra info relating to how much to stake on the offer if a calculation is required. As the dutching calculators are used by matched bettors of all different experience and bankrolls we never have a suggested stake of over $100. This suggested stake amount can be adjusted manually. You may not have enough funds in the bookmaker so may wish to reduce the suggested stake. To gain a larger bonus. Often there are bonuses that the stake can be increased to gain a bigger bonus if the promotion triggers. The max bonus is in the bonus description at the top of the page. To maximise the bonus. Some offers require a calculation to work out the stake required to maximise the bonus. This information is in the bonus description at the top of the page. After you have adjusted your suggested stake click “Recalculate Optimal Stakes” to get the new suggested way of playing all the offers for the cheapest qualifying loss. If the box the bookies odds are in is orange, it means that we haven’t been able to pull the odds for that bookmaker. The odds will display as 1.00 and the stake will be set to 0 for all outcomes. In this scenario you will need to visit the bookmakers page and find the odds, enter them into the correct outcome on the calculator then click “Recalculate Optimal Stakes”. If the box the bookies odds are in is green, it means that they are the best odds that are available on that outcome. If the profit and loss background is red it means there is a qualifying loss. This isn’t a bad thing and in most cases you will incur a qualifying loss while attempting to qualify for more bonuses. Trust in the EV that is what you can expect to make on average from playing the promotions. If the profit and loss background is green it means there is a qualifying profit. This will usually only happen if you have enhanced odds for outcomes and you have factored them in to the calculation. You can change the odds manually on the calculator. The odds are in orange and haven’t been pulled from the bookmakers website so you would visit the bookies websites then enter the odds. When visiting the bookmakers site the odds have changed in which case you may want to update them. You have an enhanced odds promotion such as Ladbrokes paying 2.00 for Richmond Tigers to win. You would want to update that manually. You are getting an enhanced odds if a team wins such as with Crownbets double winnings promotion. After you have adjusted your odds click “Recalculate Optimal Stakes” to get the new suggested way of playing all the offers for the cheapest qualifying loss. You can select which bookies appear in the calculator by changing your account settings. You can also deselect bookies from appearing in individual calculators by clicking on the bookie logo. To get the bookie to reappear you will need to go in to options and select “Show all bookies” instead of “show only active”. Then click the faded bookie logo to get it to reappear in the calculations. You don’t want to play this particular offer at the bookmaker due to either limited funds or a desire to prolong the life of your account. The promotions are generally giving us a very good margin over the bookmakers. You aren’t going to profit on every event but if you keep playing enough games and promotions then over time you will end up making very close to the expected value. Using the Bonus Money dutching calculator will ensure you are always getting the lowest qualifying cost possible which will generally be around 3-4%. Anything under 6% is acceptable. Advanced mode can be selected from the options menu. If you select advanced mode all future dutching calculators that you open will also be in advanced mode unless you change it back to the basic mode. Ability to 'Lock Outcome'. This is useful if you want to play one of the offers on a certain team (e.g an early payout offer on the outsider). Select SNR odds. This is useful if you wish to add a bonus bet in with other dutched bets. You can lock an outcome to ensure that when the optimal stakes are recalculated that you are on that outcome and your selected bookie. If you wish to change it back simply select ‘no outcome’ and it will calculate the cheapest qualifying loss. You can add additional rows to the calculator and enter odds and stakes. You may wish to use a bonus bet at a bookie and also to qualify for another promotion by placing a second bet. By adding another row you can factor both of these bets in. If doing this we would always suggest backing the same outcome with both your free bet and your qualifying bet. Always place a qualifying bet first as if you don’t you may not qualify for an additional bonus if it triggers as many terms state only the first bet on an event counts to qualify for the promotion and that bonus bets don’t count to qualify. Having this ticked will mean that the suggested back amounts in Betfair will update automatically to create an equal profit. The calculators load the cheapest way to combine all of the suggested stakes. There are some offers such as ‘lead at any time and if you draw get a bonus’ in soccer that only make sense to play on a team and not a draw. If the calculator preloads on a draw it is important to select advanced mode and then lock in one of the teams to ensure your bet can gain you a potential bonus.